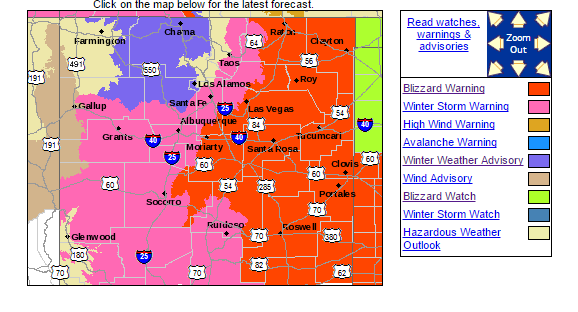 Blizzard Warnings Now In Effect For NE-E-C-SE NM. Time To Prepare For This Historic Blizzard Is Now! NCEP WPC 72-Hour Worst Case Scenario Forecast Snowfall Totals. Valid @ 5 AM MST Monday. Courtesy Of The El Paso NWS Office. Nationwide Watches & Warnings In Effect. Midland NWS Watches & Warnings In Effect. Lubbock NWS Watches & Warnings In Effect. El Paso NWS Watches & Warnings In Effect. Albuquerque NWS Watches & Warnings In Effect. 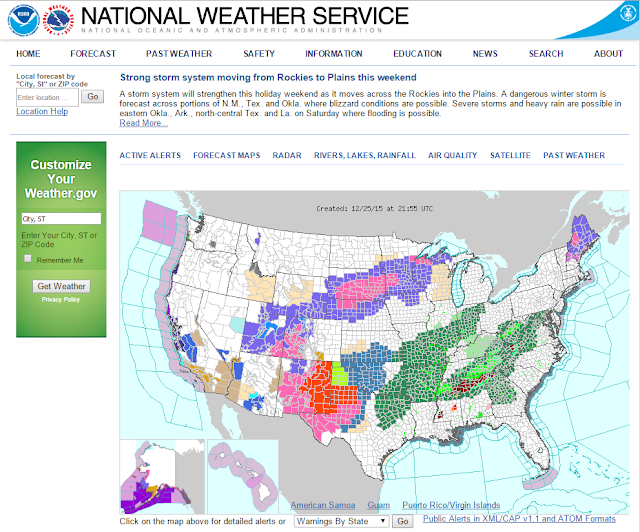 Latest Local National Weather Service Forecasts. 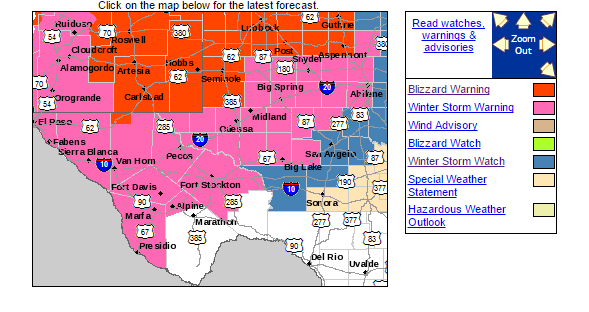 Blizzard Warning For Eddy/Culberson/Lea Co's. Blizzard Warning For NE-E-C-SE New Mexico. Blizzard Warning For The Lubbock, TX & Surrounding Areas. 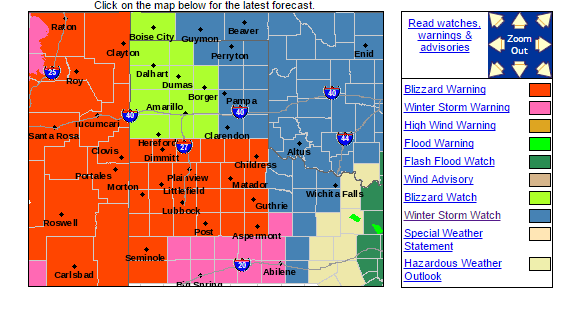 Historic Blizzard Across Parts Of The Texas Panhandle & South Plains. 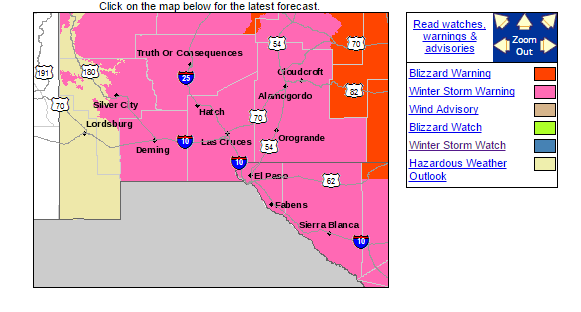 A BLIZZARD WARNING REMAINS IN EFFECT FOR ALL OF NE-E-CNTRL-SE NM FROM NOON SATURDAY THROUGH SUNDAY NIGHT. This includes all of Chaves, Eddy, and Lea Counties. It also includes parts of Lincoln and Culberson (Guadalupe Pass and vicinity) Co's. In West Texas this includes areas from Andrews and Seminole northward to the Texas Panhandle including the Lubbock and Amarillo areas. Most of the rest of New Mexico is under Winter Storm Warnings except for the far northwestern Corner in the Farmington area. Extreme southwestern New Mexico is under a Winter Weather Advisory. Historic Blizzard/Winter Storm will arrive in about twenty hours from now. When its all said and done with this blizzard/winter storm will be a history maker and not soon forgotten! It still looks really bad for the area...and I still hope that I am wrong about this one. I want to stress once again folks that this storm will be nothing to mess with. This will be a life threatening situation if you are caught out in the open on roads that are becoming buried in snow drifts of over five feet. This will simply render them impassable. Not only will you be stranded but its highly probable nobody may be able to get to you either. Once the blizzard gets underway Saturday night local roadways are going to go downhill in a hurry. We are looking at the very real possibility of widespread road closures and shutdowns. Once this happens wherever you are is where you are going to be...perhaps for days. Expect power outages, road closures, everything grinding to a halt due to the heavy snow creating whiteout conditions being driven by north to northeasterly winds sustained at 25-45 mph with gusts to 55-65 mph. Snow drifts will easily be capable of burying cars and trucks and even some smaller buildings such as small sheds and small barns. These drifts may also block north and northeast facing entrances to buildings. 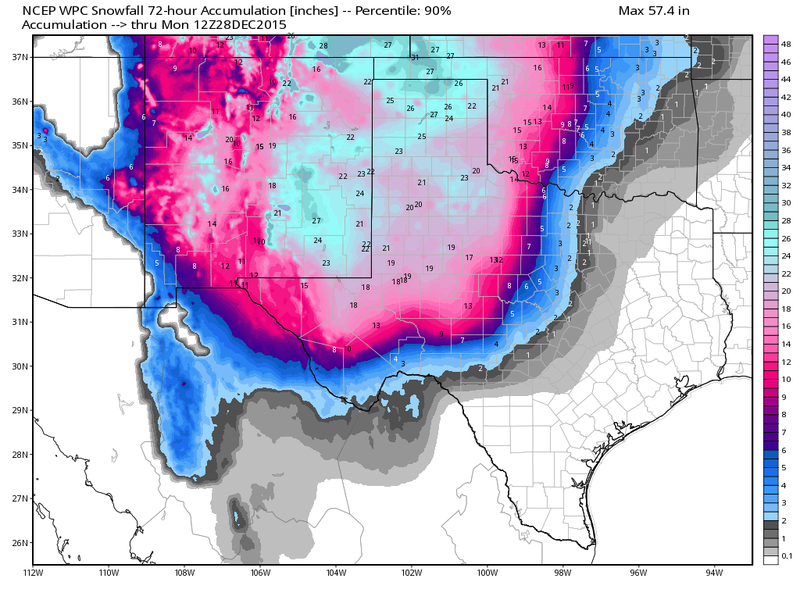 Oilfield activity in southeastern New Mexico and West Texas will be severely impacted by this event. Given the forecast snowfall totals, the blowing and drifting of the snow, wind chill values of 0°F or lower, and temperatures remaining below freezing for the next week...I think that this storm will be worse than the February 2011 event, and the Christmas storm of 2011 that dropped a foot of snow on us, and the Christmas week storm of 1997 that dumped 7"-31" on the local area. Again I hope that I am wrong. Expect frozen and busted water pipes. Have a backup plan for this. How many of you remember the February 2011 storm that severely impacted the area, and all of the hardware stores that ran out of plumbing supplies? This very well may happen again. Speaking of supplies make sure you have everything you need to ride this blizzard out by sunset Saturday. We have a little over twenty four hours to prepare for this blizzard and its anticipated widespread impacts! This will be a high end impact event for much of New Mexico and West Texas. Livestock and rangeland animals will be in danger of dying from the heavy snows, deep snow drifts, high winds, temperatures below freezing (for the next week) and wind chill values dropping down to 0°F or lower. Model forecasts continue to forecast storm snowfall totals of 10" to maybe as high as 36" in the worst hit areas. 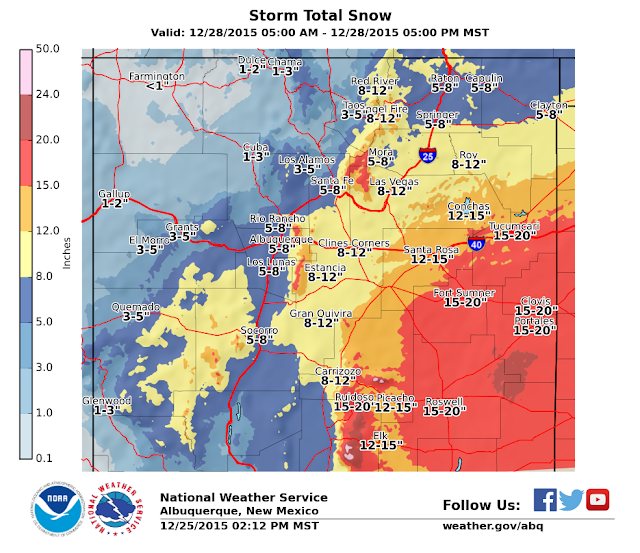 Widespread snowfall totals of 12"-20" are expected with isolated higher totals. Snow drifts will easily reach heights of 3' to 5'. In some areas even higher drifts will be possible. No I cannot pinpoint where that will be. All of southeastern New Mexico is the bulls eye of this blizzard. What will be just as important as the very heavy snowfall will be the blowing and drifting snow. Whiteout conditions will develop with the visibility dropping down to zero with northeasterly winds gusts up to 55-65 mph for hours Saturday night into Sunday. What is the definition of a blizzard? In the United States, the National Weather Service defines a blizzard as a severe snowstorm characterized by strong winds causing blowing snow that results in low visibilities. The difference between a blizzard and a snowstorm is the strength of the wind, not the amount of snow. To be a blizzard, a snow storm must have sustained winds or frequent gusts that are greater than or equal to 56 km/h (35 mph) with blowing or drifting snow which reduces visibility to 400 m or 0.25 mi (1/4 of a mile) or less and must last for a prolonged period of time—typically three hours or more. While severe cold and large amounts of drifting snow may accompany blizzards, they are not required. Blizzards can bring whiteout conditions, and can paralyze regions for days at a time, particularly where snowfall is unusual or rare. A severe blizzard has winds over 72 km/h (45 mph), near zero visibility, and temperatures of −12 °C (10 °F) or lower. New Mexico Roads Mobile Link For Your Phones.